Serge Aleksandrovich Zenkovsky (16 June 1907 in Kiev, Russian Empire – 31 March 1990) was a Russian historian, expatriate in the United States since 1949. He specialized in Economic, Eastern European and Central Asian history. Zenkovsky was born on 16 June 1907 (Gregorian calendar) in Kiev. His father Aleksandr (1878–1966) was a professor of economics, his mother Elena (1884–1954) the daughter of a physician and professor of surgery; he also had a sister, Nadezhda. After the Russian Revolution, the family fled first to Constantinople, then Berlin and Prague, where Zenkovsky graduated in economic history. He then left his family in Prague to move to Paris, where his uncle Vasilii Vasilievich Zenkovsky lived. There, he graduated from the University of Paris in Eastern European and Modern history. He also began to learn English. From 1930 to 1939, he worked in Paris as business manager. In 1938, with his immigration papers to the United States already in order, Zenkovsky planned to visit his family in Prague one last time, but was caught up in the German occupation of Czechoslovakia. Unable to leave, he continued his studies at Charles University, earning a PhD in Russian and Modern history. His dissertation, written in German, was on Russian policies in Sinkiang from 1856 to 1914. After escaping from the Prague Offensive, Zenkovsky and his parents wound up in the American zone of occupation in Germany, where he taught at the Polytechnical school of the International Refugee Organization in Munich, until making their way to America in 1949. Zenkovsky spent a year shrubbing shrimp at Schrafft's in New York City, until he was hired as teacher for various courses on Slavonic subjects at Indiana University. In 1952, he married Beaty Jean Bubbers, who was studying for her M.A. in Russian. Two years later, in 1954, he was invited to Harvard University as visiting lecturer for the Russian Research Center, while his wife completed her PhD at Radcliffe College. With another move to Stetson University (including a post for teacher of Russian for his wife) started a period of steady movement; in 1960 to the University of Colorado, in 1962 back to Stanton. There, he founded the University's Russian institute, provoking angry reactions from locals who feared possible Communist influence. In 1964, Zenkovsky was awarded a Guggenheim fellowship. In 1967, the Zenkovskys moved to Vanderbilt University, where they stayed until they retired to Florida in 1977. However, they still kept up their scholarly output with a new edition and translation of the Nikon Chronicles. Starting in 1986, Zenkovsky struggled against several illnesses, but continued editing The Nikonian Chronicle together with his wife, completing the final volume in time for the thousandth anniversary of the Christianization of Kievan Rus' in 1988. Zenkovsky died on 31 March 1990. At the time of his death, Zenkovsky had published over two hundred articles and books. Pan-Turkism & Islam in Russia, Cambridge 1960. Medieval Russia's Epics, Chronicles and Tales, New York 1963. Russia's Old Believers, Munich 1970. ^ a b c d e f Ralph T. Fisher: Obituary. Serge A. Zenkovsky (1907–1990), in: The Russian Review (1991, No. 1), p. 121–123. Otakar Ševčík was a Czech violinist and influential teacher. He was known as a soloist and an ensemble player, including his occasional performances with Eugène Ysaÿe. Victor Serge, born Victor Lvovich Kibalchich, was a Russian revolutionary and writer. Originally an anarchist, he joined the Bolsheviks five months after arriving in Petrograd in January 1919 and later worked for the Comintern as a journalist, editor and translator. He was critical of the Stalinist regime and remained a revolutionary Marxist until his death. He is best remembered for his Memoirs of a Revolutionary and series of seven 'witness-novels' chronicling the lives of revolutionaries of the first half of the 20th century. Volodymyr Sichynskyi was a Ukrainian émigré architect, graphic artist, and art historian. Serge Lifar was a French ballet dancer and choreographer of Ukrainian origin, famous as one of the greatest male ballet dancers of the 20th century. Not only a dancer, Lifar was also a choreographer, director, writer, theoretician about dance, and collector. Theodosius of Kiev or Theodosius of the Caves is an 11th-century saint who brought Cenobitic Monasticism to Kievan Rus' and, together with St Anthony of Kiev, founded the Kiev Caves Lavra. A hagiography of Theodosius was written in the twelfth century. Dmytro Doroshenko was a prominent Ukrainian political figure during the revolution of 1917–1918 and a leading Ukrainian emigre historian during the inter-war period. Doroshenko was a supporter of federal ties with the Russian Republic and a member of the Ukrainian Party of Socialist Federalists. Nataliia Polonska-Vasylenko was one of the foremost Ukrainian historians of the 20th century. She was a wife of the Ukrainian academician of history and statesman Mykola Vasylenko. 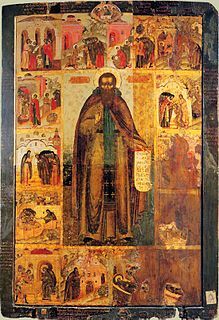 Stephen of Perm was a fourteenth-century painter and missionary credited with the conversion of the Komi to Christianity and the establishment of the Bishopric of Perm'. Stephen also created the Old Permic script, which makes him the founding-father of Permian written tradition. "The Enlightener of Perm" or the "Apostle of the Permians", as he is sometimes called, is commemorated by the Catholic and Orthodox Churches on April 26. Fedir Parfenovych Bohatyrchuk was a Russian-Soviet-Ukrainian-Canadian International Master of chess, and an International Master of correspondence chess. He also was a doctor of medicine (radiologist), a political activist, a writer, and a chess writer. A connection has been implied between Bohatyrchuk and the fictional Dr. Zhivago, the subject of a popular novel by Boris Pasternak, as well as a 1965 Academy Award-winning film of the same name, based on this novel. Serge Elisséeff was a Russian-French scholar and Japanologist who was one of the first Westerners to study Japanese at a university in Japan. He began studying Japanese at the University of Berlin, then transferred to Tokyo Imperial University in 1912, becoming the first Westerner to graduate in Japanese as well as its first Western graduate student. Victor Tourjansky was a Russian actor, screenwriter and film director who emigrated after the Russian Revolution of 1917. He worked in France, Germany, Italy and the USA. Petr Zenkl, PhD. was an influential Czech politician, government minister, Mayor of Prague, chairman of the Czechoslovak National Socialist Party (1945-1948), deputy Prime Minister of Czechoslovakia (1946-1948) and the chairman of exile Council of Free Czechoslovakia (1949-1974). Adrian Victorovich Prakhov was a Russian art critic, archaeologist and art historian.